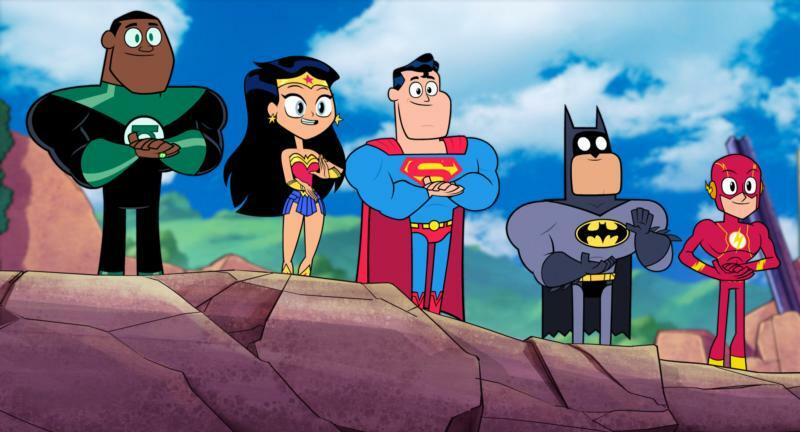 NEW YORK (CNS) — Though a mixed bag of good values and a bit of dodgy humor renders it acceptable but not ideal for kids, sharp satire makes the witty animated comedy “Teen Titans Go! To the Movies” (Warner Bros.) a hoot for their elders. As it skewers a broad range of subjects, from some politicians’ preoccupation with the size of their hands to 1980s-style anthems of affirmation, the film wins smiles and laughs at a remarkably steady pace. Even the plot is a vehicle for mockery. A youthful version of Batman’s sidekick Robin (voice of Scott Menville) becomes obsessed by the fact that, unlike all other superheroes, no movie has ever been made about him. The other members of the ensemble of crime fighters Robin leads — shape-shifting Beast Boy (voice of Greg Cipes), human-mechanical mashup Cyborg (voice of Khary Payton), teleporting Raven (voice of Tara Strong) and alien princess Starfire (voice of Hynden Walch) — don’t share his fixation with Hollywood. But, as supportive pals, they go along for the ride. Through their battle with master mind manipulator Slade (voice of Will Arnett) the team acquires the evil nemesis considered essential to their quest. And they eventually convince Tinseltown director Jade Wilson (voice of Kristen Bell) to feature them. But Robin’s ego and the silliness of his pals get in the way, leading to a breakup of the group. As Robin and his buddies strive to be taken seriously, this big-screen adaptation of the Cartoon Network TV series hilariously harpoons a wide range of pop-culture targets in a manner that will amuse grownups. Kids, meanwhile, will be diverted by its vivid imagery. Helmed by Aaron Horvath and Peter Rida Michail, and scripted by Horvath and Michael Jelenic, the snappy proceedings carry good messages about friendship, teamwork and the dangers of selfishness. But some parents may not appreciate the potty jokes — or the enjoyment Robin derives from imagining what it would be like to wave his green tights-clad backside at moviegoers. And a final line of dialogue encouraging youngsters to ask about the birds and bees may also disconcert them. This is, in fact, something of an oddity: a cartoon take-off more enjoyable for grownups than small fry. How many tots, after all, are likely to get jokes mocking actor Shia LaBeouf or the 2011 misfire “Green Lantern”? Sly, and safe enough for older boys and girls, “Teen Titans Go! To the Movies” will be most appreciatively savored by those with at least a few gray hairs. The film contains occasional scatological and anatomical humor and a single vague reference to reproduction. The Catholic News Service classification is A-II — adults and adolescents. The Motion Picture Association of America rating is PG — parental guidance suggested. Some material may not be suitable for children. NEXT: How big is too big for media companies?